Menlo Park, Calif. – Annual family premiums for employer-sponsored health insurance rose an average of 3 percent to $18,142 this year, a modest increase at a time when workers’ wages (2.5%) and inflation (1.1%) also grew modestly, according to the benchmark Kaiser Family Foundation/Health Research & Educational Trust (HRET) 2016 Employer Health Benefits Survey released today. Workers on average contribute $5,277 annually toward their family premiums. This year’s low family premium increase is similar to last year’s (4%) and reflects a significant slowdown over the past 15 years. 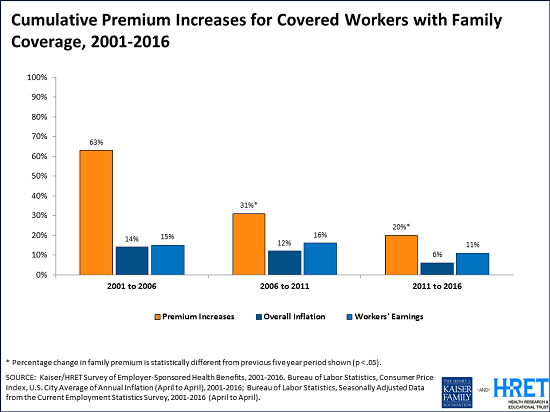 Since 2011, average family premiums have increased 20 percent, more slowly than the previous five years (31% increase from 2006 and 2011) and more slowly than the five years before that (63% from 2001 to 2006). “We’re seeing premiums rising at historically slow rates, which helps workers and employers alike, but it’s made possible in part by the more rapid rise in the deductibles workers must pay,” KFF President and CEO Drew Altman said. The recent trend in part reflects covered workers moving into high-deductible plans compatible with Health Savings Accounts (HSAs) or tied to Health Reimbursement Arrangements (HRAs). These plans have lower average premiums than other plan types. In 2016, 29 percent of all workers were in such plans, up from 20 percent in 2014, while a shrinking share of workers (48% in 2016, down from 58% in 2014) are enrolled in Preferred Provider Organization (PPO) plans, which have higher-than-average premiums. These shifts effectively reduced the average premium increase by half a percentage point in each of the past two years, the analysis shows. 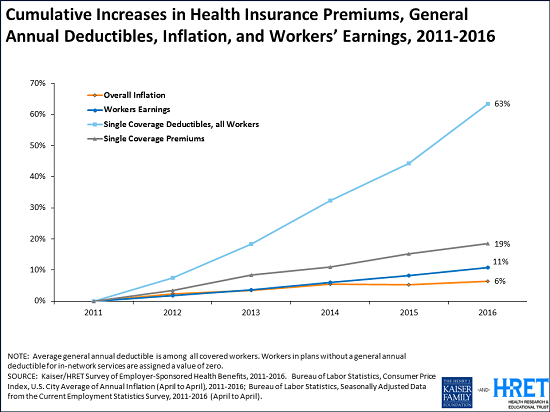 Again, partly as a result of this trend, the survey finds average deductibles continuing to rise for covered workers. In 2016, 83 percent of covered workers face a deductible for single coverage, which averages $1,478. That’s up $159 or 12 percent from 2015, and $486 or 49 percent since 2011. The average deductible for workers who face one is higher for workers in small firms (three to 199 employers) than in large firms ($2,069 vs. $1,238). For the first time, the survey also finds half (51%) of all covered workers face deductibles of at least $1,000 annually for single coverage. This includes two thirds (65%) of workers at small firms (three-199 workers), who typically face higher deductibles than workers at large firms (200 or more workers). The 18th annual Kaiser/HRET survey of more than 1,900 small and large employers provides a detailed picture of the status and trends in employer-sponsored health insurance, costs, and coverage. In addition to the full report and summary of findings released today, the journal Health Affairs is publishing a Web First article with select findings, and the Foundation is releasing an updated interactive graphic that charts the survey’s premium trends for different groups, including by firm size, region, and industry. “The importance of this study is its ability to inform decision makers from all sectors as new or emerging strategies for health care coverage are being constructed. This is especially helpful for consumers as they understand health plan structures and what it means for them,” said Dr. Ken Anderson, HRET’s chief operating officer. This year, the Affordable Care Act provision requiring employers with at least 50 full-time equivalent employees to offer health benefits to full-time workers or pay a penalty took full effect. The survey finds 93 percent of firms with at least 50 employees offer health benefits to at least some employees, and the vast majority say their coverage meets the ACA’s requirements for value and affordability. The survey also finds little evidence that businesses are reducing workers’ hours to avoid the law’s requirements to offer coverage. In fact, more employers with 50 or more full-time equivalent workers who offer coverage say they shifted or plan to shift workers’ hours from part-time to full-time status to make them eligible for health benefits (7%) than say they shifted or plan to shift workers from full-time to part-time status to make them ineligible (2%). Overall 56 percent of employers offer health benefits to at least some of their workers this year, statistically unchanged from 57 percent last year. Offer rates vary by firm size, with less than half (46%) of the smallest firms (three to nine workers) offering coverage and essentially all employers with at least 1,000 workers doing so. Since 2011, the share of firms with 10 to 49 workers who offer coverage has fallen from 74 percent to 66 percent. 10 percent of all offering firms give additional compensation to workers who enroll in their spouse’s health plan instead of the company’s plan. This share is similar for large and small firms. Among firms offering family coverage, 45 percent of small businesses and 18 percent of larger ones contribute the same dollar amount towards premiums for workers whether they enroll their dependents or not. This in effect requires workers to pay the full costs of enrolling their dependents. “Particularly for workers at small firms, these limitations and incentives can create challenges for low-income workers to afford health coverage for their families,” said study lead author Gary Claxton, a Foundation vice president and director of the Health Care Marketplace Project. Single Premiums. Premiums for single coverage now average $6,435 annually, of which workers contribute $1,129 on average. Cadillac tax. The survey provides an updated look at employers’ response to the Affordable Care Act’s excise tax on high-cost health plans, sometimes called the “Cadillac tax,” which is now scheduled to take effect in 2020. Nearly two thirds (64%) of large employers offering health benefits say that they conducted an analysis to determine if any of their plans would exceed the Cadillac tax thresholds, and a quarter (27%) of this group say their largest plan would do so. In addition, 15 percent say they have increased their plan’s cost-sharing to avoid reaching the excise tax thresholds, and 9 percent say they switched to a lower-cost health plan. Health risk assessments. Most large firms offering health benefits (59%) offer to give workers a health risk assessment that asks questions about their medical history, health status, and lifestyle. Of those that do, most (54%) offer financial incentives to encourage workers to complete the assessment, such as reduced premiums or cost-sharing; eligibility for other wellness benefits; or cash, contributions to an HSA, or merchandise. Biometric screenings. As with health risk assessments, most large firms offering health benefits (53%) offer workers biometric screenings, which are health examinations that measure such things as body weight, cholesterol, blood pressure, stress, and nutrition. Most (59%) of these firms offer financial incentives for undergoing the screenings, and some (14%) tie the incentives to meeting specific outcomes such as a targeted body mass index (BMI) or cholesterol level. The annual survey is a joint project of the Kaiser Family Foundation and the Health Research & Educational Trust. The survey was conducted between January and June of 2016 and included 3,110 randomly selected, non-federal public and private firms with three or more employees (including 1,933 that responded to the full survey and 1,177 others that responded to a single question about offering coverage). A research team at Kaiser, HRET and NORC at the University of Chicago, led by Kaiser vice president and long-time project director Gary Claxton, designed, conducted and analyzed the survey. For more information on the survey methodology, please visit the Survey Design and Methods Section. Health Affairs is the leading journal at the intersection of health, health care, and policy. Published by Project HOPE, the peer-reviewed journal appears each month in print, with frequent Web First studies and health policy briefs published at www.healthaffairs.org. The full text of each Health Affairs Web First paper is available free of charge to all website visitors for a one-week period following posting; it then switches to pay-per-view for nonsubscribers. You can also find the journal on Facebook and Twitter. Read daily perspectives on Health Affairs Blog. Download our podcasts, including monthly Narrative Matters essays, on iTunes. Tap into Health Affairs content with the iPad app.